WASHINGTON — The ObamaCare enrollment numbers are finally out and published. Problem is, the enrollment numbers are terrible even by the lowest minimum standards. 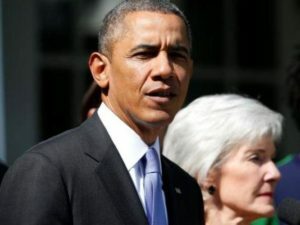 Reuters reported that not even 1 million people signed up for ObamaCare within the first month of the health care law. About 106,000 people signed up for the health care exchanges across the nation, which averages out to about 25 people signing up per day. Now Senate and House Democrats are breaking ranks with the Obama White House and offer legislation that would mitigate the political blowback from the “disastrous” health care law. An estimated 4 million Americans have lost their individual health care plans as ObamaCare forced insurance companies to cancel those plans. For example, only five D.C. residents signed up for ObamaCare after a month of operation. Yet Obama kept blaming insurance companies with complying with his law. He said that he needed a “tech surge” to save the law and took his defense to the American people via Twitter. But, this excuse did not fool the American people. His disapproval rating remains at 53% (according to RealClearPolitics) and the health care law has a 51% disapproval rating among Americans. One of the worst defenses of the law came from MSNBC’s Ed Schultz, who said the liberal mainstream media wants ObamaCare to fail. Problem with that argument is that the media covered up or ignored stories of how the law will affect the American people, until the problem was too large to ignore. The Affordable Care Act, or ObamaCare’s official name, is not affordable and does not provide health care coverage for millions of Americans.